Why are my iTunes factory equalizer presets all flat? If I try to select any iTunes equalizer preset, they're all flat. This includes the factory ones. How do I get them back? If you have your iTunes audio output set to go to an AppleTV, it will display all presets as flat. 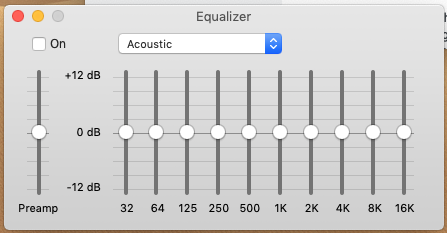 Change it to another setting, and the currently-selected equalizer preset will still display as flat. Choose a new equalizer preset, and it will look fine. Our ATV is called "Living Room". So in the example here, I would choose "Computer", then choose a new equalizer preset, and it will work fine. Why does iTunes continually ask me to authorize my computer? Can I activate three 3GS iPhones if i set them all back to factory settings using iTunes? Why I can't remove iTunes and how to remove it? Why are some of music files not being added to my iCloud Music Library?